Electricity is a potential hazard found in all areas of mining operations, from extraction and processing to accommodation, storage and administration facilities, and it can range from a few volts up to 220 kV. Electric shocks as low as 50 V AC may cause serious ill effects. 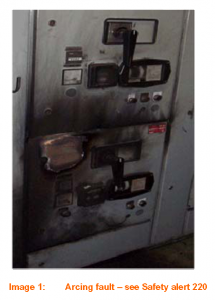 More significant electrical faults may cause arc flashes, cubicle explosions and fires, and depending on where this occurs, have potentially catastrophic implications. So it is important the design, construction, commissioning, operation and decommissioning of electrical equipment and installations is carried out to relevant legislation, standards, codes and good engineering practice. A maintenance strategy, including consideration of failure modes of protection equipment and the use of back up protection should be developed before completion and implemented immediately after the equipment is commissioned. Section 112 Specifications instructions and other information about plant, requires that specifications and operating instructions are available to and readily accessible by any worker required to use the plant or undertake activities related to the instructions at the mine. included among the data used to determine that risks are at acceptable levels. As well as the types of installation mentioned above, mining safety and health regulators can require any other site, appearing to have an unacceptable level of risk in any of these areas, to show how these risks have been addressed.